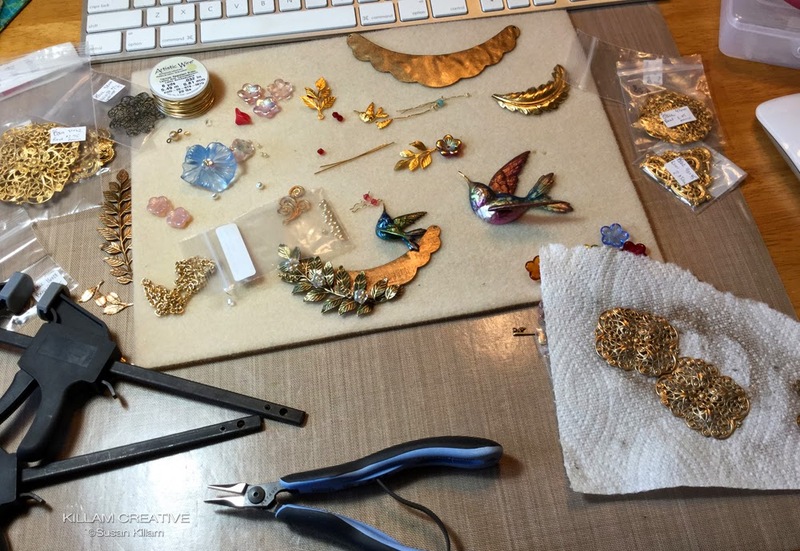 The challenge is simply to create a new line of jewelry, consisting of at least 5 different pieces that are cohesive and recognizable as the Killam Creative brand. I say "simply" but this has been nothing near simple. As I suspected would happen, my creativity has been stretched and I've learned about loads of new techniques. It's been great to experiment with new mediums and a bonus to discover new uses for products I already have on the shelf. A goal for each of the challenge participants is to keep within a certain retail price point. For many of us this means simplifying (there's that word again) our typical style. If you know my paper-based works you'll know I don't design simple. 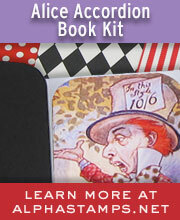 I thrive on over-the-top, layered, finely detailed projects! Another goal is to design the items in such a way that they can be reproduced easily. 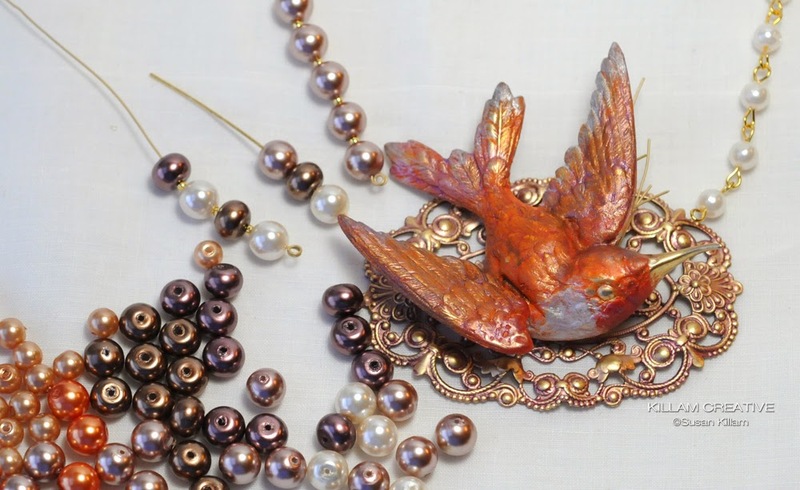 Many of the challenge participants usually choose to make one-of-a-kind (OOAK) jewelry, as I've always made OOAK projects. For us to tackle simple and reproducible and pricepoint specific... challenges indeed! With that, I give you the current Flights Of Fancy line. She is a wee girl at 1 3/4" long. I still want to perch her on this filigree with some kind of (smaller) greens and that lovely trumpet flower configuration. I'll attach a simple chain for a lovely necklace. Next, we have a a 3" long Fancy in a more dramatic coloring. 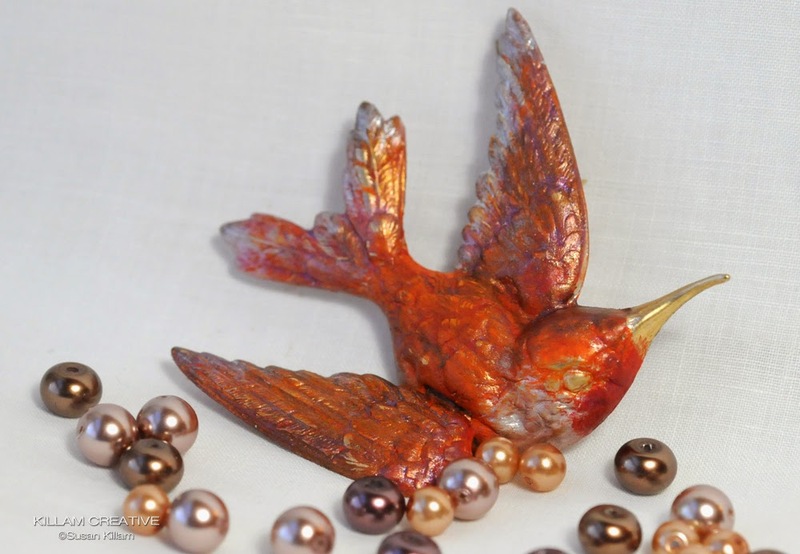 She's modeled after a brightly colored Rofous Hummingbird with oranges and purples. She's delightful! 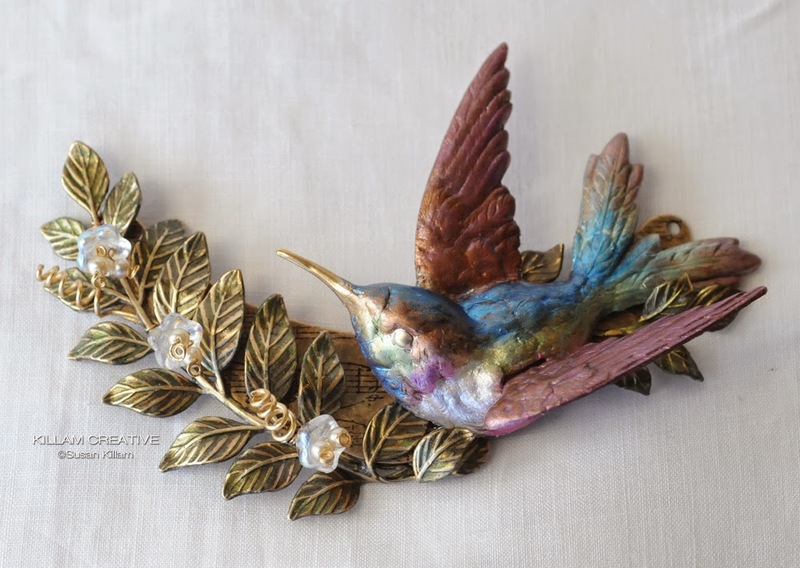 She's perched (temporarily for now) on a gorgeous large raw brass filigree which has been custom colored with Gilder's Paste and acrylic paint. I'm still deciding which chain to use for her, and how/if to adorn the base any more. It has been interesting to be working with that retail price point in mind, that's for sure! I have another 3" Fancy to share. She's on a small crescent shaped necklace blank, which I've stamped with music notes and sealed. I'm considering giving her a whopping big flower on the chain -- the scale is actually better in person than in the photo. 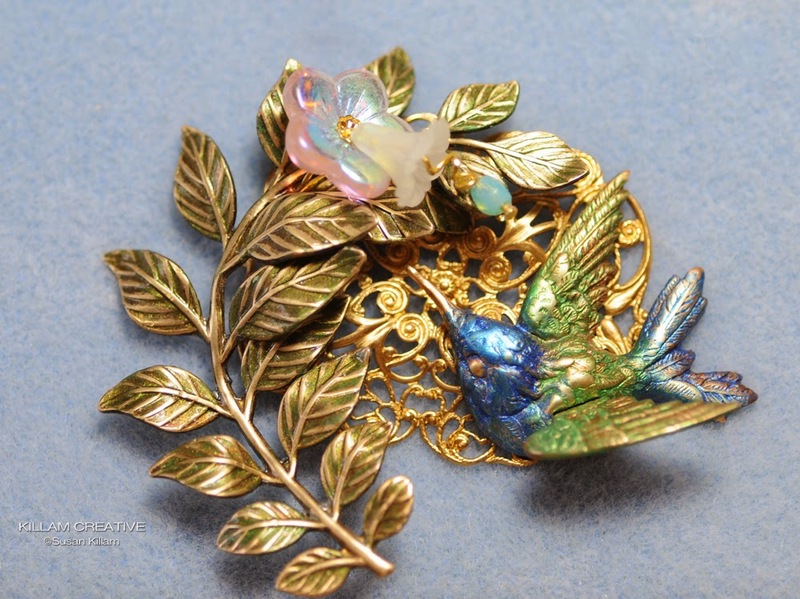 The Flights Of Fancy line will have themed pieces, including bracelets and brooches as well as necklaces. This challenge has a private Facebook group which has been an incredible source of inspiration for me and many others involved. We've had serious discussions about design fundamentals, fashion trends and pricing, as well as the importance of the pyramid model practiced by the likes of Louis Vuitton as well as many other high end brands. 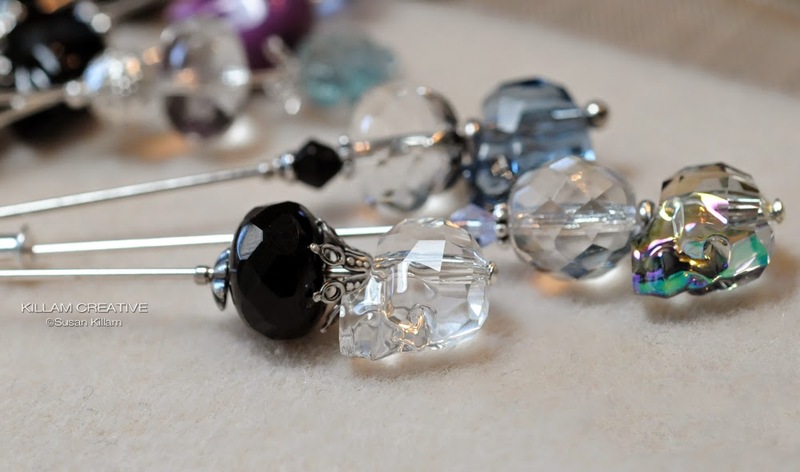 I encourage you to join B'Sue Boutiques Creative Group on Facebook, where all of her customers are welcomed to gather. It's a warm, welcoming group. 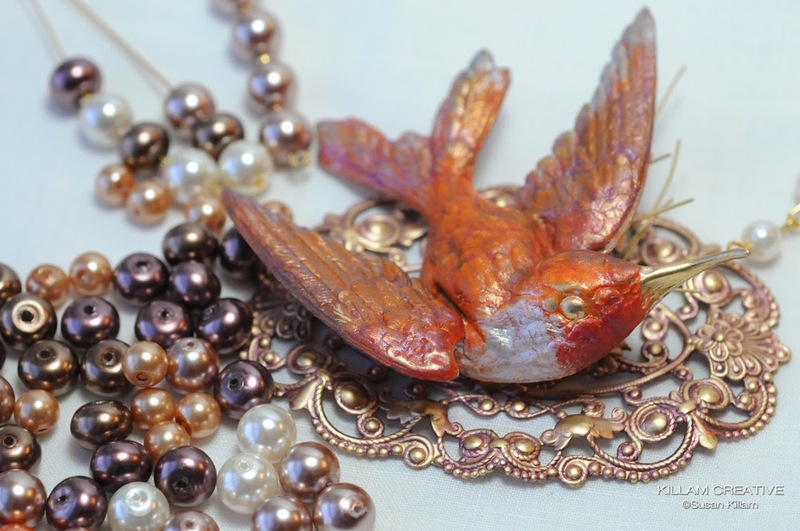 If you are into a little shopping and haven't discovered B'Sue Boutiques yet, click here! Please join my fellow challenge members to see how they have done in the past month. We have one more month together! Susan Killam <<<<<------------ That's me! It's the day after what was supposed to be my second WTW post... Ha! 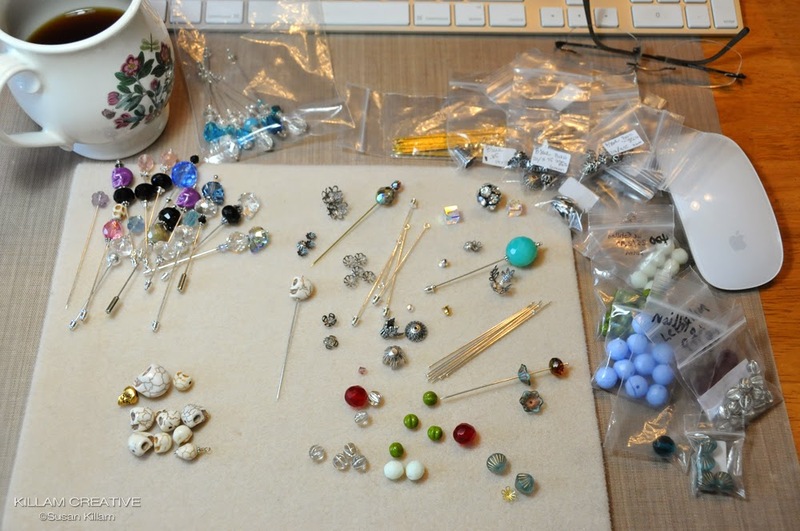 Keeping myself honest, here is what my work table looked like yesterday. I'll give you a bit of a tour! 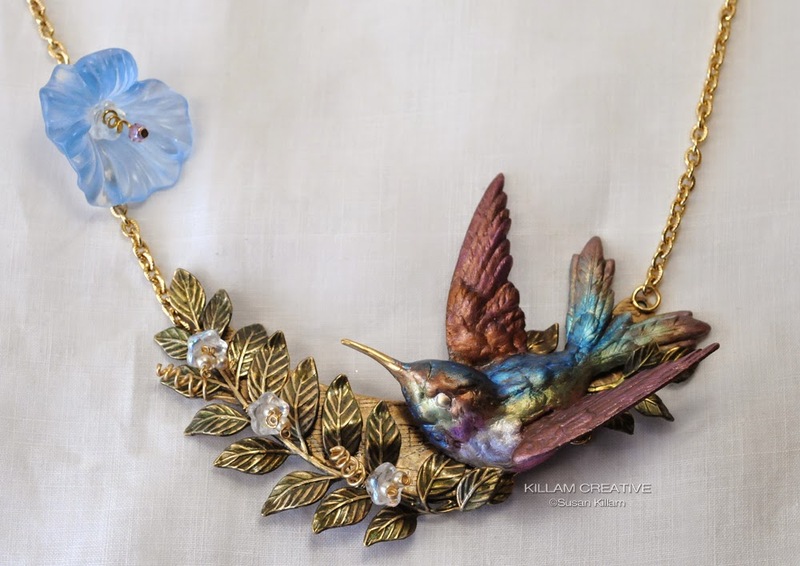 If you recall a post from a few weeks ago, my new jewelry line is called Flights Of Fancy. Here I'm trying to get over a hump on what to do with the small necklace crescent in the front. I knew I wanted to use the leaves. I've bent the end around to the back and one of those birds will be added, along with a few other details. The challenge for me is to keep it simple. I'm so used to making highly embellished collage-type art! To move around the table, the black clamps are THE BEST. If you have a Harbor Freight nearby, they are $1.99 each. If not you can find them at any hardware store. I used them to secure the leaves to the crescent while the super duper adhesive cured. THE BEST! I now have a decent selection of filigree bases for my cagework and possibly this line. I could be content just shuffling filigree around on the table - it's so beautiful! The filigree on the paper towel in front started out as raw brass. I've colored the pieces with German Silver Guilder's Paste. I think this is my favorite color in the whole wide world.... until the next one comes along. I love working with and wearing both silver and gold, and this color is a nice blend of both. Guilder's Paste is a cool product that I've barely worked with; have you used it? I'd love to see your beauties -- leave a link in comments and I'll come visit you! 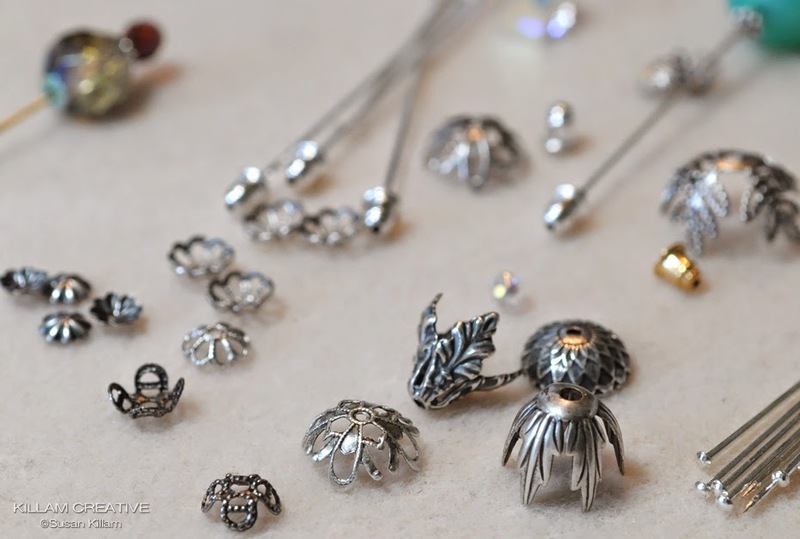 This week is all about stick pins - skull pins, Czech glass pins, vintage bead pins. The works! 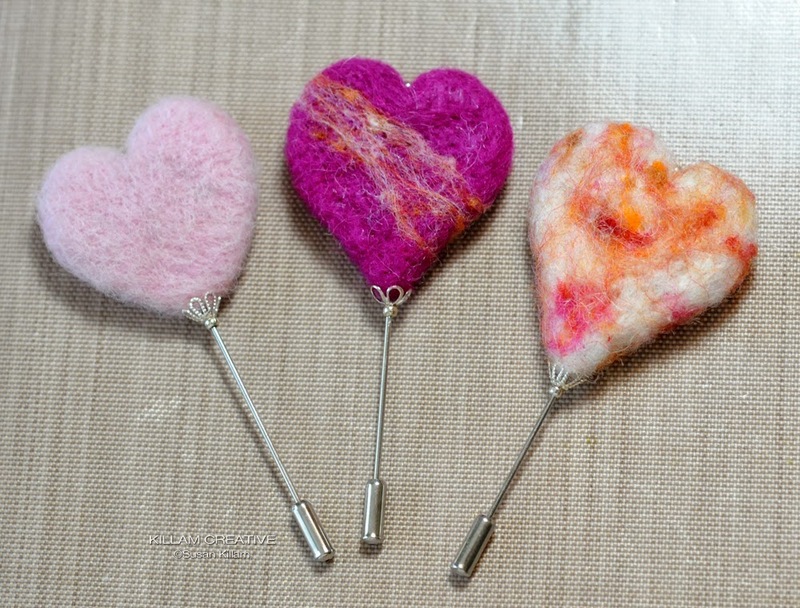 The needle felted heart pins above should've been in the shop a month ago. 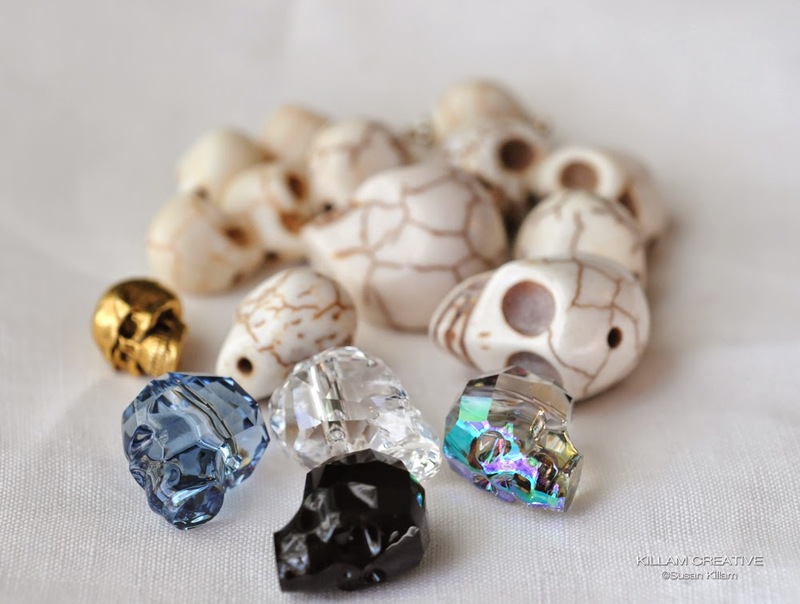 Swarovski and Howlite Skulls, ready and waiting! I found great new caps (US made, of course!) that will add even more flair to the pins. They give a nice vintage feel, and in some cases -- like the front Swarovski skull above -- a gothic vibe. I love it! This is my view this morning, plus Swarovski pearls that came out after the photo. See the cornflower blue beads? Those are cool vintage Czech pieces. Some have a givre effect (transparent glass fused over an opaque core), but it's more like a transparent random stripe. It's pretty cool. That's all the show and tell for me today. It's time to get out of my pajamas, refill that coffee and get to work! I hope you make time to create today -- even if it's designing in your head. That counts, right? It does for me! Thank you for visiting. As always, these will end up in the Etsy stick pin shop unless someone claims 'em first!